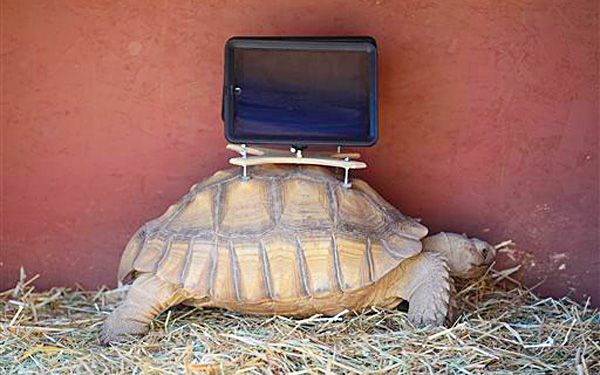 Three tortoises will be allowed to roam around with iPads mounted on their backs. But some people think this is not fair to the animals. What do you think? The exhibit will be at a museum and is part of its grand opening. The African Sulcata tortoises will roam on the roof deck garden. Each will have two iPads. They will show video of area ghost towns. Folks who don't think tortoises should carry iPads want the exhibit stopped. The animals are not designed for it, they said. The tortoises were rescued from a breeder. A vet is overseeing their care. Their diet includes leafy vegetables. The iPads are on mounts used to track to wild animals. The tortoises will get new homes after the exhibit closes Oct. 5. I don't want turtles to carry an iPad on its back because the iPad might be heavy for the turtle. I don't want the exhibit closed, it is just that I don't want the turtle to hurt itself. Then the person who tried to do the experiment will be the one who is blamed. I feel very sad for the turtles because they carry those heavy iPads. I am amazed because a person wants to have an experiment about turtles carrying an iPad on its own back. I dont know what I think about this but they are taking care of them so thats good, but they might not like the heavy ipads on them it could hurt their backs. I hope not because I love tortoises and turtles so much! I think they should have used ipods not ipads the ipads could hurt them. It is a cool idea I have to say that! Where are the tortoises going after its done and why? I hope the tortoises are happy! This article is about three tortoises. These tortoises will be in a exhibit at a museum with iPads on their back. The museum rescued these tortoises from a breeder. Their diet also includes leafy vegetables. The tortoises will be up for adoption after the exhibit closes. That is my summary on Would A Turtle Want A iPad On It's Back? Do the tortoises play on the ipads? They got new homes Oct. 5. People think this is not fare to the animals. I think it was fare. I have never seen an i pad on a turtles back. I wish I could see one in real life. I wonder what they do with the i pad. I think they see where the turtles go and what they do. I also think they use it for what they do all the time. So maybe next time i should find where to look for turtles that have i pads on their back. Just adding on to what Sophia said ... Yeah turtles should not be doing that. Some people think its amusing to do funny stuff to animals , but I don't These are living creatures that are suffering from other peoples idiotic ideas yeah its not fair. Tortoises don't need ipads on their back and your are crazy to put that on a tortoises back. It looks like it would hurt the turtles. 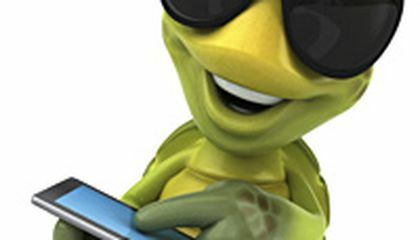 I think that its cool that turtles had an ipad on their backs LOVE IT !!!!!!!!!!! !